Are you an Impulse Buyer? Well...since I started my Kraft University DVDs last week, I have been thinking a lot about how seventy two percent of ALL cookie and cracker sales come from an impulse buy. I don't know about you but when I go to the store, hardly ever do I put chocolate cakesters or dove chocolate with nuts on my list. Wait, do I make a list? I think I impulse buy everything. Wow, they are right. Not too many people put these things on there list. That's were the devil of my job comes in. My job is to put the product right in front of the buyer's face and make it look so good that the buyer skips over their grocery list of laundry detergent and bread to get to the wonderfully new fattening Fugee Oreos. Well, sorry about. You have to admit though, our taste buds don't lie. What do you buy that is an impulse buy? Well, Haley turned 3 today. I still remember holding her for the first time. I remember she came out pail because the cord was wrapped several times around her neck. I didn't get to hold her for the first 3 hours of her life. I sat in a room all by myself as doctors worked to get some color in her skin. I remember what an amazing miracle my Heavenly Father had given me as I finally got to hold one of his choicest children. Despite all the tantrums and hardships I have had as I have raised her, I can safely say, she is one of the most amazing blessings in my life. Happy Birthday to my first baby, Haley! Sorry about the 800 pictures. I just couldn't decide which ones to do. Thanks to everyone who came. It was fun to share the fun with everyone and Haley loved everything about it. We are still talking about it today and how her party was yesterday. What do you do with your mismatched socks? I have been having a hard time with this lately, especially since Maya's socks are like finger warmers and slip in between the seal and the door of the washer. (Yeah, our washer eats our socks) Anyways, after my surgery they sent me home with a tub to use in case I needed to throw up. Well, that became my mismatched socks bin and every time laundry comes around all the socks go in there and now I think I'm down to 6 odd sock matches. Maybe one day my washer will spit some of them back out. Until then, I have my little bin. 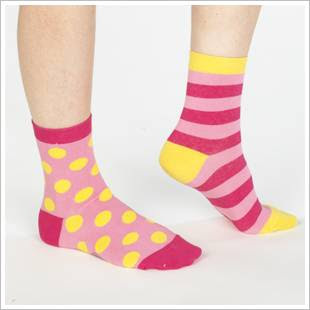 I am just wondering what you do with your odd socks without a match? Do you have a mismatched sock bin? Well...Maya is offically on the move. No, not crawling but very mobile on the feet, as long as there is something to hang on to. She has discovered the trash and today she found this Capri Sun that still had some in it. Gross. This is one of the hardest things about being a mother for me. I just am not looking forward to the day when my boy brings home a snake or snail. 1. There is absolutely NO way you can get me to massage your feet! 2. Watermelon reminds me that summer is almost here! 3. I cannot live without my really high soft King size bed. 4. Rip sticking and playing a game of ice hockey are two things I'd like to try. 5. When life hands you lemons I complain to someone about it. 6. Going to the beach every Saturday afternoon with my friends to pick up on some hot surfers is one of my favorite childhood memories. 7. And as for the weekend, tonight I'm looking forward to the new garlic alfredo pizza we got at Costco last night, tomorrow my plans include work, and playing outside and Sunday, I want to make some bows and go to church! We spent the afternoon in the yard. It seems like ever since we moved into our home, our yard consumes a lot of our time. Between pulling and spraying weeds, mowing the grass, fertilizing, watering, trimming, planting, everything keeps us very busy. I decided I love having a yard but realize how much work it really is to maintain a home and yard. It was fun yesterday. We made it a family affair. I got the kids greased up with sunscreen. Haley rode her bike and played with the neighbor kids. Maya sat in her buggy and play house. Matt mowed and I did the weeds as I worked on a very well needed tan. What a fun family outing. My mom is lucky enough to celebrate both her birthday and mother's day in the same week. Since it's about 7:30 and the kids are still sleeping, I wanted to post to my mother, who reads my blog every so often. Maybe a lot of you feel the same way but it took me to have kids of my own to really appreciate my mother and the role that she plays in my life. I still am amazed at how she had 6 kids and how she continues to work hard to love and care for each of us, even at the grown stages that we are all at. My best memories of my mother growing up were of us going to the grocery store every week and walking up and down every isle. I don't know why but that was so fun to me, seeing how my mom would load up 2 full carts and it would all be gone the next week. I also remember our trips to the mall. The best three words out of her mouth, "Don't tell dad." I think about that saying, "When mamma ain't happy, ain't nobody happy." That was the truth in our home, only I can't remember very many times that my mother was not happy. To the best mom, grandma and friend ever, I love you mom. HAPPY MOTHER'S DAY AND BIRTHDAY! Kristi gave this idea to me and it has taken me a couple weeks to think about it and have Matt point some of them to me. 1. I LOVE the smell of blueberries but can't stand the taste. 3. I Hate toes. Don't want to touch or look at anyones toes. Especially, toe nails. YUCK!!! 5. I could pay $50 to go to Disneyland to watch people. I love to watch what people do and how stupid people act. I think that's why I'm a fan of reality shows, fake or not. 6. I don't like to touch any part of a public restroom. I use about 4 seat covers to cover every part of the seat. Once I wash my hands, the door is opened with the paper towel and is thrown in the trash as the door closes behind me. 7. When I watch a movie or show, I will often fall asleep if I stay in the same spot for longer then 5 minutes. That's why movies are not the best for me. 8. I'm a time freak and hate being late. I start to get all stressed inside when I'm running behind or my love bug husband is taking his sweet time. 9. Kinda a weird one but I use about 8-10 wipes to change any poopy diaper. 10. Same goes for blowing my nose or my kids, use as many kleenex as possible. Just as long as I don't have to touch snot. 11. While Matt is trying to explain something that has to do with fixing the computer, I would rather save the brain space for something else. 12. Same with video games, that Halo game...my gun is always up in the air and I'm in the corner of the room. I just can't figure it out. Plus, I'm dizzy after playing for a few minutes. well kinda... just over the creek from my house. I moved to Utah about 10 years ago from Orange County. It was a hard change to leave my whole family but an easy change as I saw a lot of my friends from high school leave and move on to different locations and schools. I decided I needed a change in my life. Not long after moving here I began to see how different Utah was from California. I remember a tumbleweed peacefully passing through State street. I remember the beautiful mountains and that there was this season called, hunting season. Coming for a city where the local freeway was 14 lanes wide, it made me really excited to get on the freeway and it would actually be moving at 5 o'clock. Although there are many things I miss about California, I have made a home for myself here. I have enjoyed my drives home as I get to be close to farms with sheep, goats, horses and cows. The house down the street has a full on zoo there that is free with pigs, kangaroos, llamas, you name it. There is a stream that runs right outside my back yard. It's so fun to be apart of Utah. I just wish I could move back to California in the winter. The beauties of our Heavenly Father's creations amaze me everyday. I was a little alarmed when Haley walked in with this outfit on today. You would have thought it was St. Patrick's Day. Oh, they keep getting better. I guess I can't complain. She can dress herself. Whether that is a good thing or not...?? ?